The asking price for the Stereo Polyphase may seem steep. But with 24-volt operation and extensive features, what a phaser this is. Masses of potential. Highly interactive. Abundance of great sounds. Cost is high when you add an expression pedal. 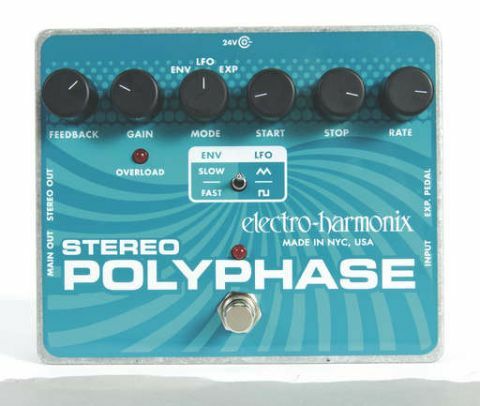 The Stereo Polyphase is a brilliant, if costly, pedal. The Stereo Pulsar and Clone Theory also feature in the EXHO range. In recent years, Electro-Harmonix have been onto something very good indeed by offering their unique brand of frazzled stompbox psychedelia in more compact and robust housings. Alongside the genuinely pocket-sized Nano line, there are the slightly larger EHXO pedals, such as this Stereo Polyphase. Like its siblings the Stereo Pulsar and Clone Theory, the Stereo Polyphase is a stereo modulation unit wth a diecast aluminium Hammond-style chassis. It should stand up to years of heavy stomping. The lack of a quick-release battery access hatch isn't really an issue with something like a Big Muff, as the battery life is such that you won't have to unscrew the back plate very often. However, in the case of modulation effects such as this, it's often a different story. We would like to see some provision for this in the form of a simple plastic hatch, or metal plate like many manufacturers utilise. The Stereo Polyphase is the most complex of the EXHO pedals, and as a result it enables you to have an almost synth-like level of control over the effects parameters. You can select whether the phase shifter is controlled by envelope follower, low-frequency oscillator or external expression pedal, then control its range with the start and stop controls. In LFO mode, the rate control is active and the toggle switch determines the shape of oscillation, while in envelope follower mode the switch determines how quickly the phase shifter reacts to the incoming signal. It's not complicated though: plugging it in quickly reveals that you don't need to be wearing a lab coat or have an unkempt beard to get a good sound out of the Polyphase. The Stereo Polyphase is the key to an experimental guitarist's paradise; it offers a level of interactivity way beyond most of its rivals and as a result its potential is enormous. At more tame settings, the liquid warmth of the Small Stone is a definite reference point, while the three mode settings allow you to enter previously unexplored swirling aural vistas. Adding an external expression pedal cranks the weirdness potential up a notch, helping you to achieve some dramatic rhythmic effects. The Polyphase can also do a pretty convincing impression of the phase sound on Sonic Youth's The Diamond Sea from their 1995 Washing Machine album, which our office Youth aficionado assures us is top of the tree for phaser sounds.